A boy of four went to see his first movie with his parents. Popcorn in hand, he settled into his seat, and eventually, after some previews, a trumpet fanfare sounded and an image of a spotlight illumined word-shaped sculpture cast its glow through the darkened theater. A star field appeared, and yellow words began scrolling up the screen to diminish and vanish into the distant darkness, ushered on their way by the lyrical strains of an unseen symphony. As the last specks of yellow that were the words vanished, the camera panned down across the star field to reveal the massive arc of a brown, arid looking world baking under the rays of twin suns. A white star ship cruises into view, trading fire with something behind it. Impressive as the white ship is, it is nothing compared to the great behemoth that follows it, a slate grey triangle of pure might plunging across the screen and serving as a wedge, separating the audience from mundane reality and catapulting them into another time and place. The movie was Star Wars, but you already knew that. Needless to say, I was that boy. The thing is, I’m not the only one. From a movie standpoint, Star Wars stands as my generation’s touch stone. More than any other movie, it defined the movie experience for us. That’s not to say that there weren’t other great movies. Jaws was a little mature for the pre-school set, but I know of certain individuals who would throttle me through the computer if I did not speak to its brilliance. Likewise, Rocky, Raiders of the Lost Ark and ET deserve mention as great movies of Generation X. All were iconic, unifying touch stones for a generation. And there were others, too numerous to name that could also be on this list. But none was greater than Star Wars. It’s easy to look back at Star Wars with the jaded eye of an adult. It’s easy to complain about digitally enhanced special editions, and Greedo shooting first, and the Gungan who shall not be named. It’s easy to cringe at Anakin’s dialog , to cry out “YES!! !” when he asks Amidala if she is in as much pain as he is, or to mourn the awesomeness lost when Lucas declawed Chewbaca and replaced Wookies with Ewoks. It’s easy to turn up our nose at the marketing machine that sprang forth from Lucas’s creation. We’re a cynical generation. It’s what we do. Yet, Star Wars is still a touch stone. I know this because of all the references in this paragraph; I need to explain exactly none. Well, that boy grew up. He married a girl who once dressed up as a bun headed Princess Leia for Halloween, even though she was not a sci-fi geek, and they had kids. That boy is now father to a two year old daughter and a four and a half year old son. Last month he went onto Netflix and sent for the Original Theatrical Version of Star Wars, and as his daughter made her way to nap time, he sat down with his son and they watched the movie. Okay…enough with the third person. Harry’s close to reading, but he’s not quite there yet, so I read the opening crawl to him. That crawl drops us right into a tale of high adventure: a princess pursued by sinister agents on a desperate mission vital to the rebellion against the evil empire. It’s a brief, simplistic introduction using powerful, evocative words that just scream adventure. Of course, the words had minimal impact for Harry. The concept of something like a civil war or a rebellion are far beyond him at this point, but the kid knows a big space ship when he sees one, and if the opening of Spaceballs has desensitized you to an enormous starship crossing the screen, you haven’t seen a four year-old’s eyes pop upon seeing Darth Vader’s star destroyer dwarf the Tantive IV. And we were off on a cinematic journey that was nostalgic for me and new and eye-popping for Harry. He was introduced to Vader and Leia, Luke and Ben, Han and Chewie, and, of course R2D2 and C3PO. Then there were jawas and sandpeople, banthas and dewbacks, and the denizens of the Mos Eisley Cantina. And we can’t forget the storm troopers. There were some things he didn’t quite get, like The Force, or the impact of Alderaan’s destruction. I drew his eyes away from the screen during the shots of the charred skeletons on Owen and Beru Lars. The first time through, the light sabers didn’t do much for him and he wanted to know why everything was happening. Each act in Star Wars has a purpose. The first act introduces the universe. The second builds the relationships among the characters. The third, of course resolves the story with the Battle of Yavin and an extend FX sequence that is as impressive now as it was 33 years ago. The Battle of Yavin, is what I took away from my earliest viewings of the movie. I didn’t care about light sabers, but I wanted to fly an X-wing and shoot down TIE fighters. I wanted to be Luke and race through the trench and fire proton torpedoes to destroy the Death Star. As it was with me, so it is with my son. Ever since he saw the movie (he’s seen it several times, and yes I did show him the enhanced version…but I have reiterated that Han shot first), the generational staying power of Star Wars has been evident. 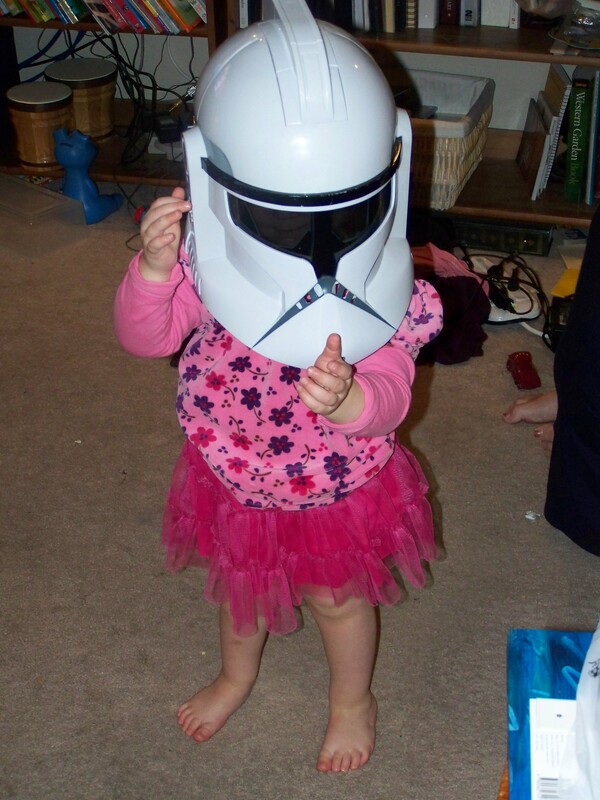 He serendipitously came into possession of a clone trooper helmet. It is now one of his most prized possessions, along with a disarmed X-wing that had been part of a game that Alissa stumbled across. In 1978, my parents and I arrived home from Christmas Eve dinner at El Coyote to find that Santa had paid a visit. I walked into the living room to find an X-Wing, a TIE Fighter, and several Star Wars figures. Well, 32 years later, Harry will walk into the living room on Christmas morning. He will find an X-Wing, a TIE Fighter and several Star Wars figures, and the Empire and the Rebel Alliance will do battle in the imagination of yet another young boy. And what about Annie? Is there a bun-headed princess in my future? This entry was posted in Projected Pixels and Emulsion and tagged star wars. Bookmark the permalink.